Sturdy, flexible tines with specific geometry prevents twigs and leaves from getting caught. Fiskars Ergonomic Rake is a lightweight large lawn rake for clearing and collecting leaves and debris quickly in larger areas. 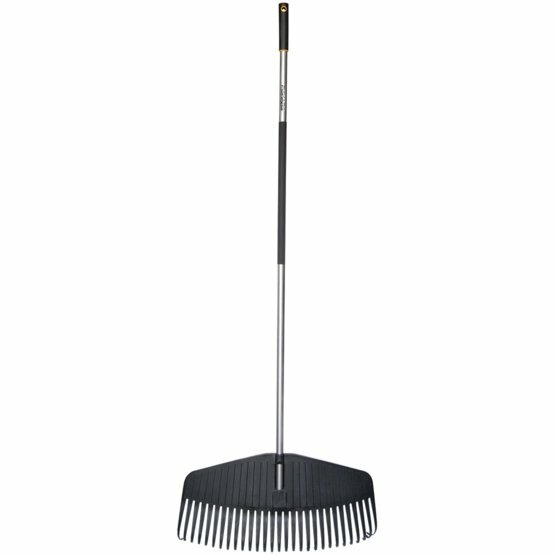 This great garden hand tool rakes leaves efficiently and is the perfect tool for general yard cleaning. With its plastic coated shaft of hardened aluminium and drop shaped soft grip handle for optimal grip, comfort is guaranteed and a perfect finish for all your yard cleaning efforts. And when your work is done, the hanging loop means you can put it away in your shed for easy storage off the floor.